According to Vauxhall this seven-seater comes complete with "handle-anything versatility" ? perfect for coping with hectic family life. The Vauxhall Zafira Tourer boasts an elegantly designed exterior plus a cabin that's not only spacious and well thought out, but also highly flexible and equipped with a raft of clever technology. 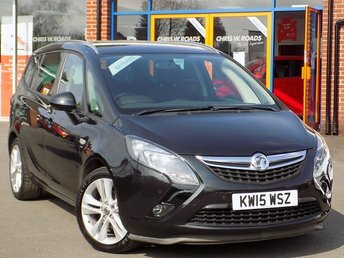 You can arrange to test drive one of the used Vauxhall Zafira Tourer models for sale in Ripley simply by contacting a member of the team at Chris W Roads Ltd today. Our experts will provide further details of the complete range of vehicles in stock and make all the necessary arrangements to get you behind the wheel in no time. Finance is available to UK residents aged 18 years or older, subject to status. Terms & Conditions apply. Indemnities may be required. Other finance offers may be available but cannot be used in conjunction with this offer. We work with a number of carefully selected credit providers who may be able to offer you finance for your purchase, commission may be received. We are only able to offer finance products from these providers. Postal Address: Chris W Roads Ltd, Brittain Drive, Ripley, Derbyshire DE5 3NB. Find contact details here. Chris W Roads Ltd is an Appointed Representative of Automotive Compliance Ltd, which is authorised and regulated by the Financial Conduct Authority (FCA No 497010). Automotive Compliance Ltds permissions as a Principal Firm allows Chris W Roads Ltd to act as a credit broker, not as a lender, for the introduction to a limited number of finance providers and to act as an agent on behalf of the insurer for insurance distribution activities only. Sub-prime finance is not guaranteed and may cost more than finance provided by a prime lender. We will try to obtain finance for you but that there is no guarantee. It may be from a sub-prime lender, and if so, the cost of finance is likely to be at a higher rate than prime lenders offer.